Photos donated by Dan Collier (VE7DES). To see all the photos Dan has contributed to the Archives, click here. 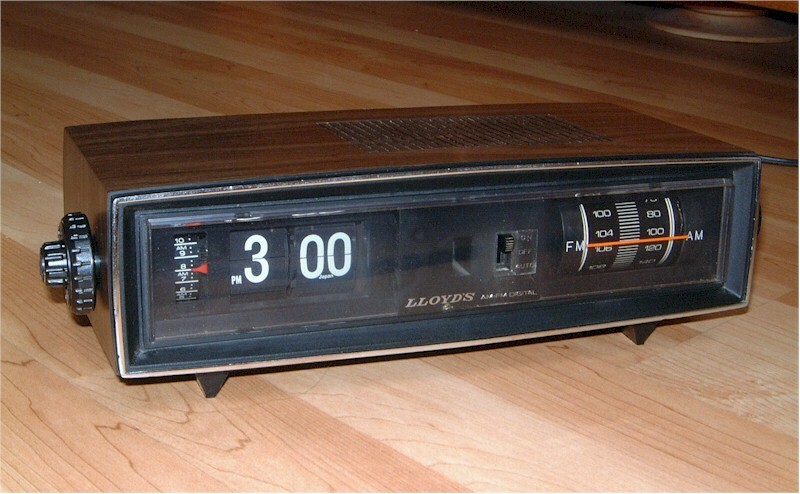 AM/FM clock radio, circa 1970-1975. Origin is Japan, according to printing on the :00 digits. Case is plastic with woodgrain finish and Masonite back panel. About a dozen silicon transistors. The FM front end is internally coupled to the cord. The rotor cup of the timing motor is visible in a slot and has stripes to serve as a check that it's running. These clock radios are usually caked in dust when you find them, the clock is stalled and the radio controls are oxidized. The motor restarted after an alcohol bath. The radio sounded terrible even after the controls were cleaned. I thought the 330K feedback resistor was open but it wasn't. Soldering an 18K resistor across it cleaned up the audio, and this also cured an AFC problem. The only thing that worked properly when I acquired this unit was the neon bulb under the clock. It's rare to find a neon bulb still shining after so many years of continuous illumination.